If you are an AutoCAD tool palettes fan, you probably have many custom palettes and command inside it. It is a quick way to access your block library, custom macro, action recorder macro and more. If you already spent some time to customize it, you will want to have it when you use other computer. The question is, how can we transfer them to AutoCAD on other computer? The quick way, you can use Migrate Custom Settings tools or Online Sync as explained in our older article here. It will transfer and sync all AutoCAD customization so you will see the same settings on both computers. However, that tool will copy every AutoCAD customization. When you only need to copy one or more palettes without other customizations, this is not the right way to go. You can export and import only tool palettes by using Customize Palette. 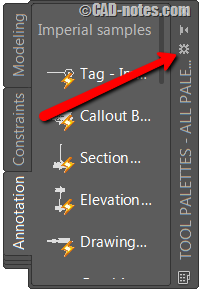 Click the tool palette properties icon as show below. Choose Customize Palette from the menu. AutoCAD will open Customize Palette dialog box. Now from the list, right click above the Palette you want to copy. Choose export from context menu. AutoCAD will ask you to save the file as .xtp format. Choose the folder where you want to save this file. As you probably have guessed, now you can copy this file to other computer. Repeat the procedure, but on the target computer choose import in Customize Palette dialog. If you want to export palettes to access AutoCAD blocks, you need to copy all the block as well. Remember, tool palettes only provide shortcut to insert your block. But it doesn’t save the block definition. 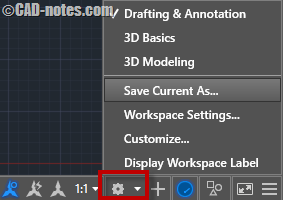 The block definition is still in the AutoCAD drawing, where you created it. Encuentro muy buena el tutorial. Por favor le agradeceria me dijera como cargar Exportar e importar en mi caso no me carga ninguno, no se q estaré haciendo mal. Vi q alguien le pasa lo mismo q a mi. Hi, I have tried what you suggested, however when I right click there is no option to allow me to export the tool Palette. Do you know if this has happened to anyone else and how did they get round this problem? I have this problem as well. There are no import/export options to be found. There are no solutions to be found either. This is the best answer I could find. Looks like the import/export feature no longer exists in autocad. For newer versions of ACAD – Right click on the title of the palette (at the top of the palette). 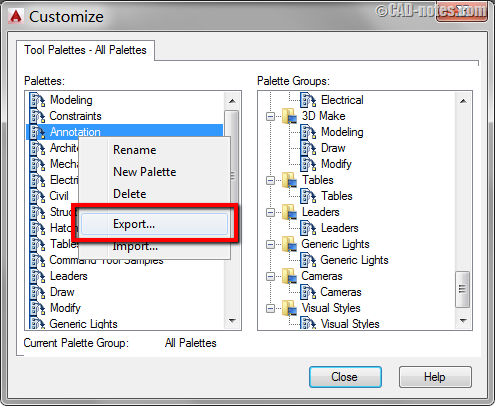 Go to Customize Palettes then select and export the specific tool palettes. Thank you for the information Slotter! You are right, there are no import/export Tool Palettes in AutoCAD Architecture. You can see this Knowledge Base as a workaround. I’ve created about 20 custom palettes, and eight palette groups. I’ve saved everything on our server, and am laying the groundwork for allowing everyone access to them. However, one thing I noticed – when I export the palettes and groups out, and one of my co-workers imports the groups, they don’t overwrite the current groups, but add to them. This is the case, even if he imports the same groups twice – he ends up with duplicate groups. How do I go about correcting this? Does this happen only on 1 computer? Can you try to copy the tool palettes from your computer (not exporting them) to a shared folder? In the client computer change the tool palette file location to point to that folder.